Dr. Alan J. Spector received his undergraduate degree at the State University of New York at Stony Brook in Stony Brook, NY. He graduated in 1985. He then went on to complete medical school at Temple University School of Podiatric Medicine in Philadelphia, Pennsylvania. He graduated in 1989 with his doctorate in Podiatric Medicine. In 1991, Dr. Spector completed his residency at Parkview Medical Center in Philadelphia, Pennsylvania. 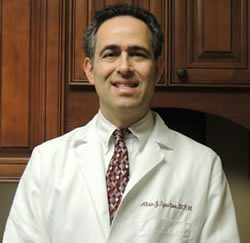 Dr. Alan J. Spector is board certified by the American Board of Foot and Ankle Surgery. He is affiliated with Ocean Medical Center, Monmouth Medical Center, the Wound Care Center at Monmouth Medical Center, and Claremont Care Center’s Sub-Acute Nursing and Rehabilitation Facility.